« My second knit hat! This weekend we cooked dinner with some friends, so I made a pumpkin chocolate cake to bring along. My original plan was to decorate the cake to look like a pumpkin face, but I mixed the orange frosting first and forgot about yellow. Plus, it looked extra peachy. 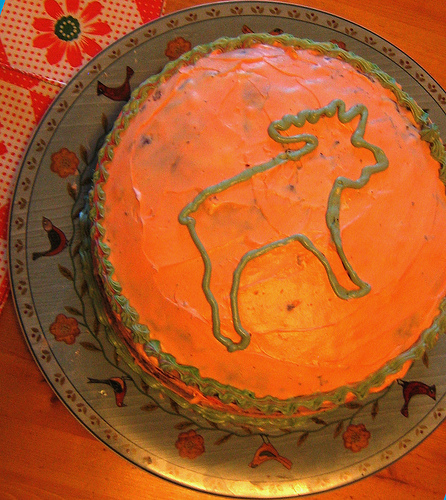 So I made the impromptu decision to make it a moose cake instead (we are in Montana, after all). All I did was press my moose-shaped cookie cutter into the cake after I’d frosted it, then outlined the design in green frosting. Easy Peasy! And it tasted good, too! hi! thanks for the cool idea...this is a great one that i'm sure to use more than once! thanks again! how creative! hope mine turns out half as nice as yours did! This is insanely, ridiculously cute. And it sounds tasty, too. I adore this cake! And I love the idea of pressing in a cookie cutter to get the outline. brillant, thanks for the good idea! thanks rachel! i love halloween. your paper garland sounds pretty! Just stumbling through your blog and wanted to say I love the owl Halloween garland! I bought the same stamp and also made a paper garland but used different embellishments on each flag. I really enjoyed your interpretation! Isn't Halloween so fun?